Tommaso di Ser Giovanni, called Masaccio, had one of the most extraordinary careers in the whole history of painting. He died very young at age twenty-eight. And thus his career which started in his teens could not have spanned more than ten years. Yet, in that one decade he changed Western art. And his paintings have been studied by every significant painter since the early Renaissance including the great Modernists, Picasso, Matisse and Rivera. His most influential work is in the Brancacci Chapel of the church of Santa Maria del Carmine in Florence. These frescoes which tell the stories of Saint Peter, have been visited by admirers almost every day for more than five hundred years. Masaccio in Florence. Working as a craftsman and studying art. In January, Masaccio registers with the painter's guild. Arte dei Medici e Speziali, while living in the district of San Niccolo on the south side of Arno river. In April, Masaccio completes the San Giovenale Triptych. First example of Brunelleschian ideas about perspective in a painting. Masaccio is working in Rome with his friend Masolino. Painting the Colonna Altarpiece for Santa Maria Maggiore, for Pope Martin(Colonna). Masaccio paints the Madonna and Child called Santa' Anna Metterza for the church of Sant Ambrogio, Florence. Masaccio's friend, Brunelleschi, makes the first mathematically precise linear perspective painting, the now lost panel of the Baptistery painted from door of the cathedral of Florence. Masaccio paints the Brancacci Chapel in Santa Maria del Carmine. Commissioned by Felice Brancacci. The Tribute Money panel of the wall fresco is the first multifigured composition since Antiquity in which figures are all unified in one coherent space. Masaccio paints the fresco, The Trinity, on the wall of Santa Maria Novella, Florence, using Brunelleschi's ideas about perspective. 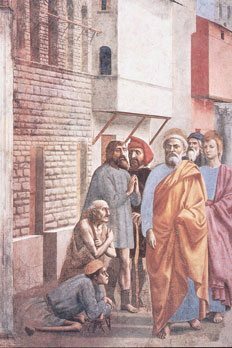 In July, Masaccio makes his Catasto (Income tax) declaration. Written in his own hand and still in Florentine archives. He is living in the Santa Croce district with his mother and his brother; also renting a bottega (workshop) from the Benedictine monastery of the Badia in Dante's neighborhood. In June, Masaccio dies in Rome. We don't know the cause of his death.